Presto change-o! Our Simone Waist Cincher works magic on your current curve situation, fashioning a whittled waist to create more appreciation for feminine hips and bosom. Fashioned from black satin, this waist cincher features double steel boning, corset cord lacing and a modesty panel. Wear over or under clothing. Fashioned from 100% polyester microfiber. Imported. Hand wash cold, line dry. Available in sizes S-3X. 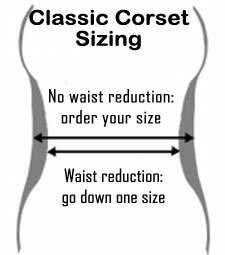 Please Note: Our Simone Cinchers are considered Waist Reducing Corsets and will provide up to 2 inches of waist reduction. See our sizing chart for ordering help. Waist Reduction: go down one size.